Once confined to sports fanatics and bodybuilders, high-protein diets are now commonplace among non-athletes too – with diets like Paleo, Atkins, Zone and Dukan advocating that people eat large quantities of fish, meat, eggs, nuts and cheese in order to lose weight. In the UK alone, 37% of people believe protein helps with weight loss, and 43% of women eat more to prevent weight gain. However some scientists suggest that high protein intake is linked to increased cancer, diabetes, and overall mortality in middle age. And restricting other foods, such as high-fibre fruit and vegetables, may cause other health problems from constipation to vitamin deficiency. So should we worry about how much protein we eat? Protein is found throughout the body, in virtually every tissue. At least 10,000 different proteins make you what you are, and protein is essential for your body's growth and repair. Protein is created from amino acids, which the human body makes either from scratch, or by modifying other amino acids. Essential amino acids come from food, and animal protein delivers all the amino acids we need. Those who don’t eat meat, fish, eggs or dairy products need to eat a wide variety of protein-containing plant-based foods. Quinoa and soya beans are the only plant foods to contain all essential amino acids. 3.How much do you need? Many people add protein to their diet using powders and shakes, but how much protein do we actually need each day? 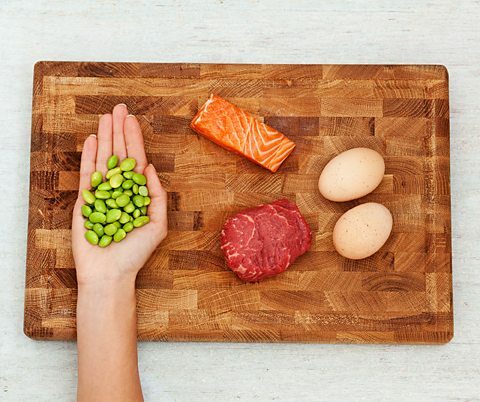 For an easy measure, one protein portion should be roughly the size of your palm, according to US health experts. In the UK, adults are advised to eat 0.75g of protein for each kilogram they weigh, based on the Reference Nutrient Intake (RNI). So if you weigh 70kg (11 stone), you should eat about 52.5g of protein a day. On average, men should eat 55g and women 45g of protein daily. That’s about 2 palm-sized portions of meat, fish, tofu, nuts or pulses. But most people find it very easy to eat a lot more. Men and women in the UK eat about 45-55% more protein than they need each day, according to the National Diet and Nutrition Survey. Eating up to twice the current RNI for protein is generally thought to be safe, but nutritionist Dr Helen Crawley says: "There is certainly no benefit to having very high protein intakes, and individuals who require high energy intakes for whatever reason should consider how to increase energy intake without increasing protein intakes excessively." Some high-protein foods are less healthy than others due to additional fat, fibre and salt content. Processing excess protein can put pressure on the kidneys, with excess animal protein linked with kidney stones and, in people with a pre-existing condition, kidney disease.Some experts say too much protein may impact bone health and, according to the British Dietetic Association, excessively high levels of protein can also cause side effects such as nausea. A study from the University of California suggested a link between too much animal protein and major increases in cancer risk and death in under-65s. But the study also found that while middle-aged people who consume a lot of animal protein tended to die younger from cancer, diabetes and other diseases, the same diet may actually improve the health of older people. Other research suggests that eating a protein-rich diet reduced the risk of dying from cancer by 60%, even for under-65s. According to the NHS, these contradictory results may indicate no overall increase in risk of death from a high-protein diet. Processed meats that have added salt and preservatives have been associated with greater risk of bowel cancer, according to the NHS. 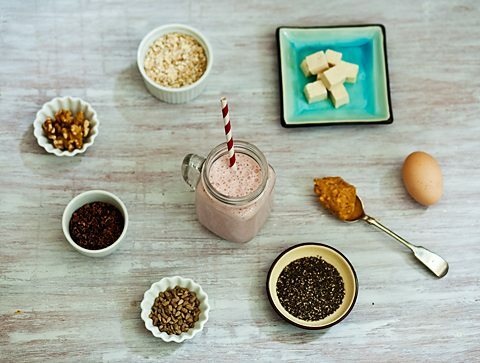 Try using (clockwise from top): Silken tofu, an egg or egg white, peanut butter, chia seeds, sunflower seeds, cacao nibs, walnuts or oats, to boost the protein content of a smoothie using natural ingredients. Protein powders like whey isolate and foods marketed as being protein-heavy are now commonplace. Shakes can add substantial amounts of extra protein to the diet, with some offering up to 55g per serving. Protein helps muscle development and recovery after exercise, but some studies say that a healthy diet alone can provide the protein needed for muscle recovery. In fact, chocolate milk is an ideal post-exercise drink, nutritionist Azmina Govindji says. She says chocolate milk’s protein content and carbohydrate from natural and added sugars will refuel muscle glycogen stores. Two University of Connecticut studies showed that runners who had 450ml of low-fat chocolate milk after a 45 minute run had better muscle protein repair and glycogen levels than those who had a calorie-matched carbohydrate-only drink. Where do you go for Protein? Eating too much protein isn't neccessarily bad for you, unless you eat it to the exclusion of other food groups, or take in too much saturated fat.